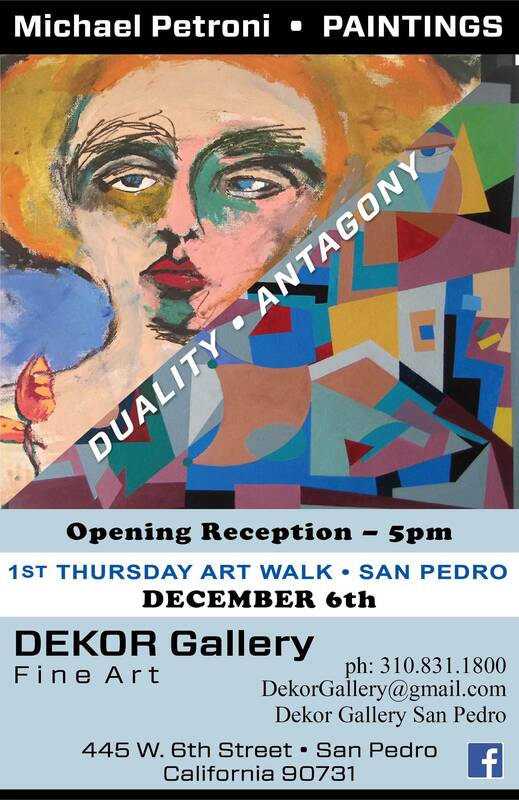 (3rd generation American—Italian/Irish) is an innovative experimental abstract painter living in San Pedro, California. He works as an independent consultant to major aerospace firms in the area of graphic design. Michael was born and raised in Manhattan Beach, CA and after an extensive tour of European art and culture, he moved to New York City in 1980. He studied fine art and photography at the School of Visual Arts on the lower east side. Some of his influences are the New York school of abstract expressionists and action painters, as well as the neo-expressionists current during his tenure in NY, that being Basquiat, Haring, Longo, Scharf, Salle, Warhol, Schnabel, and the three C’s, Italians Cucchi, Chia, and Clemente. While his career has been focused on working for TRW/Northrop Grumman as a technical illustrator/graphic designer, Michael Petroni has continuously been working as an artist, in parallel, throughout his adult life pursuing and producing a truly remarkable and substantial body of art in drawings, sculpture, and paintings.